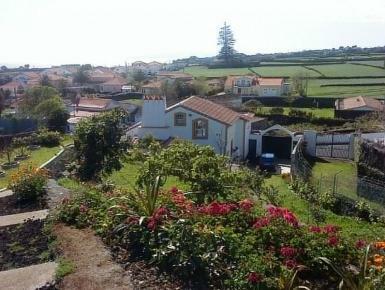 It is a beautiful and enchanting villa in the old fisherman’s village of S. Mateus (Terceira Island). The house was completely refurbished keeping most of the original centenary structures, like the kitchen designed into the old wood oven division. Like in the past, to share the warm from the wood oven, the main division is an open space shared by kitchen, dining room and living room. Now, a wood stove (“fisherman’s TV”) in the living room keeps the house warm in the cold winter nights. In the back of the ground floor two bedrooms and a bathroom complete the floor.